On Friday, 18 Penn State University students were charged in the death of 19-year-old Timothy Piazza, a fellow student who died during a fraternity pledge night on February 4. Eight of those students were charged with involuntary manslaughter, while the remaining 10 were charged with lesser crimes, such as serving alcohol to minors and engaging in hazing practices. 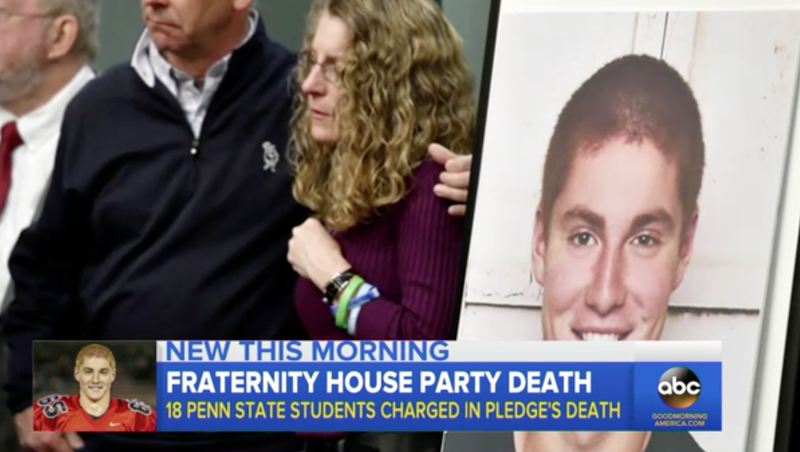 The Penn State chapter of Beta Theta Pi—the fraternity where the incident occurred, and which has since been banned from ever returning to the college—has also been charged with involuntary manslaughter, according to the New York Times. Police found Piazza injured and unconscious at the Beta Theta Pi fraternity house on February 3 and took him to a local hospital, where he was pronounced dead a few hours later. A grand jury investigation released on Friday—the findings of which are based upon footage from surveillance cameras, phone records, and testimony—contains new details of the events leading up to Piazza’s death. Several students were seen stepping over Piazza’s body throughout the night, according to ABC News.